The Milwaukee Locomotive Manufacturing Company was organized under the laws of Wisconsin in October of 1907 and was in the internal combustion locomotive manufacturing business since 1909. Milwaukee locomotives production grew from 2 ton locomotives in the early days to 20 tons in the later years. 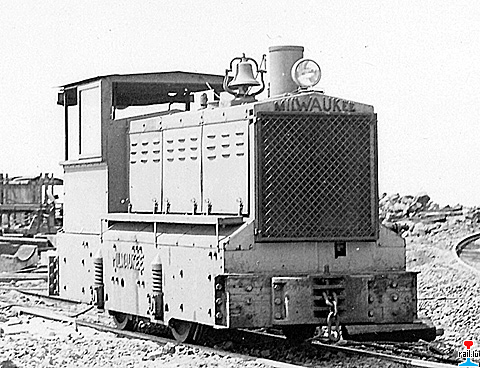 Milwaukee only produced 4 wheel locomotives equipped with the gasoline engines and mechanical transmissions. They were available in gages from 18 to 56.5 inches. Originally Milwaukee's manufacturing operations were conducted separately, but shortly after, and certainly by 1910, their manufacturing was carried on as a department of the National Brake & Electric Company of Milwaukee, which in turn had been a wholly owned subsidiary of the Westinghouse Air Brake Company since prior to 1910. On July 19, 1932, Whitcomb Locomotive Company acquired the Milwaukee Locomotive Manufacturing Company from Westinghouse Air Brake Company, in an arrangement whereby Westinghouse became a stockholder in Whitcomb Locomotive Company. This acquisition included the business, it's inventory and the good will of the company. The inventory was completely transferred to the Rochelle plant of Whitcomb and included 30 locomotives ranging in size from 4 to 16 tons, a large stock of repair parts, records, patterns and necessary machine tooling. This was done to insure present and prospective owners of Milwaukee locomotives they would have an uninterrupted, efficient and permanent source of parts and service. Whitcomb also received four completed locomotives that were stored and available for immediate sale on the Pacific Coast. 6063 J-4 4 750mm 10-33 948 Ferrocarril Mexicano S.A. The production records of Milwaukee Locomotive were stored at the East Pittsburgh, PA office of Westinghouse Air Brake Company. These records were never turned over to Baldwin or Whitcomb at the time of the sale. Westinghouse is known to have later disposed of these records. I have been unable to locate any construction number listing for Milwaukee locomotives. If anyone has this information, please contact me. Mine type locomotives followed more traditional designs. Mine type locomotives were classes G, L and M. The M class locomotives were a medium duty and had cast steel end sills, cast iron side frames, a 4 cylinder 4 cycle engine with vertical cylinders, and a two speed transmission that provided a maximum speed of 8 MPH. The G class of locomotives are identical to the M class except their engines had horizontally oriented pistons allowing for a 34 inch overall height. a peaked hood and cab. 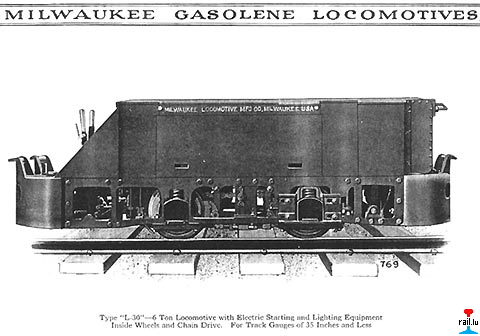 It is believed that this was the first Milwaukee locomotive to include the new style Modine section core radiator bearing the familiar Milwaukee name. In 1924, Milwaukee introduced their new H class. 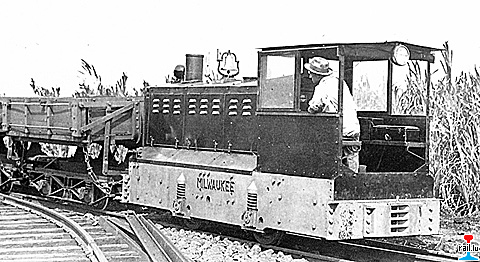 This was the first time that Milwaukee's locomotives took on the appearance of strength and mass. Even the small locomotives had the appearance of strength. This class effectively replaced prior classes W and F. The Class A, C & G locomotives had already been discontinued. 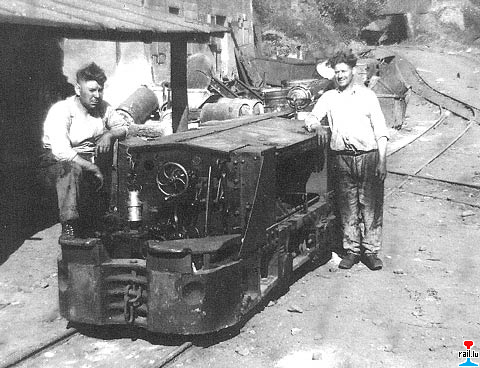 The mining classes M and L remained largely unchanged. At this point, they appear to be starting to seriously threaten Whitcomb's customer base. in the cab when in the driving position, giving the operator a clear view of the track when driving in either direction. Classes H-3, H-4, H-5, H-6, H-7, H-8, H-9, H-10, H-12, H-14 models had solid cast semi-steel sideframes attached to reinforced channel iron end sills. The H-15 model had cast steel open bar style sideframes attached to reinforced channel iron end sills. The H-16 & H-18 models had cast steel solid sideframes attached to reinforced channel iron end sills. The H-20 model had cast steel solid sideframes attached to cast steel end sills. It should be noted that not all of these models were shown in every catalog. i.e. the H-8 appears to have replaced the H-9, and the H-16 appears to have replaced the H-18, etc. It is also believed that no class H-25 locomotives were ever built. models (4 tons & 4.5 tons) that were capable of 13 MPH maximum. The frames were composed of solid cast semi-steel sideframes attached to reinforced channel iron end sills. This class also used the Modine sectional core radiators bearing the Milwaukee name cast across their tops. Military railroads of Hawaii. In a locomotive list prepared many years ago there is a U.S. Army H-12C Milwaukee locomotive with a build date of 1934 and construction number 873. The gentleman who prepared the list did not reference his sources so we are unable to verify any of the information. The only reference information we have is a reprint of a 1930 Milwaukee catalog. The attached photos appear to be identical to the 1930 catalog cut of a H-12 with the exception of four bolt heads in the corners of the side frames. The photos are from the National Archives, Record Group 77, MILITARY CONSTRUCTION FINAL REPORTS, 1934-1938, Box 24A Location: 2159E (entry 94, 1975 PI). These locomotives were used in the construction of Fort Barrette, ca. 1932, and likely remained there to service the two 16 inch guns with powder and shell from the magazines. Since the only difference we can find between the H-12 and the H-14 is the two additional tons and a drawbar pull of 7,000 lbs. at 2 and 4 MPH for the H-14 vice 6,000 lbs. for the H-12, we are of the opinion that the four bolts at the side frame corners are retaining 1,000 lb. cast weights and these photos show Milwaukee H-14s in service.